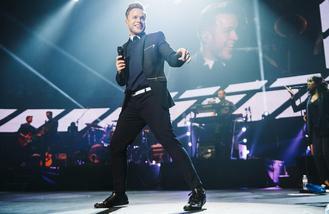 Olly Murs wants to match One Direction and JLS' singles chart success. The 'You Don't Know Love' hitmaker might share four number one albums - 'In Case You Didn't Know', 'Right Place Right Time', 'Never Been Better' and '24 Hrs' - with the 'History' boyband, but he is determined to compete with the fellow 'X Factor finalists and the former 'Beat Again' group, who were in the final of the talent show in 2008, and level their five number one songs. The 32-year-old pop star told the Daily Star newspaper: "Obviously I'd love to keep making albums. JLS got five number one singles and One Direction did too and I'm currently on four. I'd like to get another one to match the boys." The Essex hunk's confidence comes after he poured his heart out on stage at the Royal Albert Hall in London on Monday evening (27.03.17) at his Teenage Cancer Trust gig. After asking the crowd, equally of men and women, if they were single, he declared he was too. Speaking before going on stage, he confirmed his relationship status. He said: "I'm still single. Nothing has changed in that department." Olly jumped around the stage pulling some cheeky dance moves and interacted with the audience by hugging them and taking selfies throughout his performance. He got the iconic venue pumped performing pop hits from his back catalogue including 'Heart Skips a Beat', 'Troublemaker' and 'Wrapped Up'. Olly ended his set on a high with his latest song 'Years & Years', before reminding his fans how much they've "changed his life" by continuing to follow his music as he reminded them he was once just a guy working at a call centre in Essex before he shot to fame by winning 'The X Factor' in 2009. Victoria Beckham will be showing off her vocal talents when she joins James Corden for Carpool Karaoke later this year (17). Usher paid tribute to his late stepson Kile Glover on what would have been his 16th birthday on Wednesday (29Mar17). Bebe Rexha always take her brother or a friend with her on tour to ensure she remains "sane". Singer Chris Brown still hasn't taken receipt of his ex-girlfriend's domestic violence restraining order against him. Pink Floyd's 'The Dark Side of the Moon' console has sold for $1.8 million. Luc Besson was extremely impressed by how fearless Rihanna is as an actress. Pixie Lott has announced her first single in three years. Katherine Jackson will have to take to the witness stand as part of her elder abuse case against nephew Trent, a judge has ruled. Fetty Wap has been added to this year's Wireless Festival line-up.